Here at Elonera Montessori School, children can be assured of a stable and consistent environment for their education and development, from our Parent Toddler Program through Preschool, Primary, High School, all the way to Year 12. We are committed to nurturing the intellectual, social, emotional, spiritual and physical growth of our students in order to become active, compassionate, life-long learners. Our inclusive, close-knit community embraces diversity and the development of a global perspective and international understanding. The Parent Toddler Program is a Family Support Program assisting to lay a foundation for the child and adults in Montessori Education. The PTP Cottage is designed for children aged 18 months to 3 years and the activities are designed to meet the developmental needs of this age range. This means that each activity is specifically chosen to appeal to the children for the building of their psycho-sensory motor development and language skills. The Parent Toddler Program runs every Wednesday mornings in the NSW school term from 9.15am to 11.15am. This is an opportunity for you to enjoy some special time with your child, away from the pressures of the rest of the day, and to be together with other parents and children building a foundation in Montessori education. The Parent Toddler Program is an excellent preparation for your child’s transition into Stage 1. Responding to the needs of working families wanting an intimate and nurturing environment for their younger children, Elonera Montessori School is offering a new service to cater for the needs of the 2 year old child, as well as providing an ideal preparation for the Montessori Stage 1 environment. This specialised environment will prepare your child’s growing independence, self-esteem, confidence and concentration span. Part-time places are offered - 2 days (Monday - Tuesday) and 3 days (Wednesday - Friday). The part-time days are consecutive to ensure consistency in the program, peer group and teaching staff for the children. This service attracts funding for eligible families in the form of Child Care Benefit (CCB) and the 50% Child Care Rebate (CCR). Practical life materials provide the link between home and school and enhance the development of coordination, confidence, concentration and fundamental independence. They help the children adapt to their environment. The Practical Life activities include polishing, washing, pouring, dressing skills, food preparation, sewing and social skills. Sensorial materials are designed to help children become more perceptive to understand concepts and focus on the details of the world around them, and are in direct preparation for later work. Activities involve grading and matching shape, weight, touch, taste colour and sound. Language materials increase vocabulary, explore the sounds and syntax of the English language and help children to read and write. Activities commence with oral language work such as stories, speaking and sound games, through to working with sandpaper letters, writing with a movable alphabet and then reading. Mathematical concepts are offered to children concretely. Hands-on materials create an enjoyable approach to arithmetic and geometry. Children will learn to count and then to operate decimal systems and fractions. From this solid base abstraction occurs naturally. Cultural materials provide children with experiences in geography, history, music art and natural sciences. As in other areas the child first experiences culture on a concrete level. Activities include puzzle maps for geography, bells for music, personal time-lines for history, simple science experiences such as sink and float and a range of paints and materials for art. In addition to working with the Montessori Quality Assurance Program (MQAP), the pre-school has to comply with the Early Years Learning Framework (EYLF) outcomes under the National Quality Framework (NQF). Please follow this link to the Education and Care Services National Regulations. The Montessori Stage 2 is designed for children from 6 to 9 years of age (Years 1, 2 and 3) who preferably have attended the traditional Montessori Children’s House (5 day program). Stage 3 is similarly designed for children from 9 to 12 years of age (Years 4, 5 and 6). The children continue to learn from and assist one another in their classroom community, which is surrounded by an environment suited to their developmental needs. All subjects from the Children’s House are greatly expanded in the primary. Their minds focus not on facts and names but on relationships. The reasons ‘why” and the ‘how’ fascinate them. The materials found in the primary classrooms enable the children to explore past, present and future. The children see an overview of particular concepts and areas of knowledge and then focus on the specifics. Research is an important aspect of the Primary classrooms and the children explore alone, in cooperative groups and as a class, such subjects as astronomy, geology, physics, evolution, biology and history. As they study, the children begin to perceive the links between these fields and often find that new areas of study open for them. For example, the history of Egypt is tied to the Nile, geography, to art and to writing, hieroglyphics, to geometry, the 3-4-5 triangle to survey following the floods, to fauna, the crocodiles and so on, to flora, the papyrus, the writing paper to record the history which was the point we entered the chain. Mathematics and language (reading, spelling etc.) also form a pivotal part of the child’s experiences and learning. Concrete Montessori materials facilitate understanding, while a full curriculum embracing all of the elements of a traditional curriculum, approaching them from a Montessori perspective, however, is experienced. The primary Montessori classroom utilizes a modified contract system wherein certain areas and amounts of work are covered within a set time. The child is responsible for ensuring that their work is covered. Each child is therefore able to develop his/her own work patterns. For example one child may spend very lengthy periods of time on one subject then another, whilst a classmate may work for a shorter period on a wider variety of work. Yet each child will maintain a similar spread of work overall. 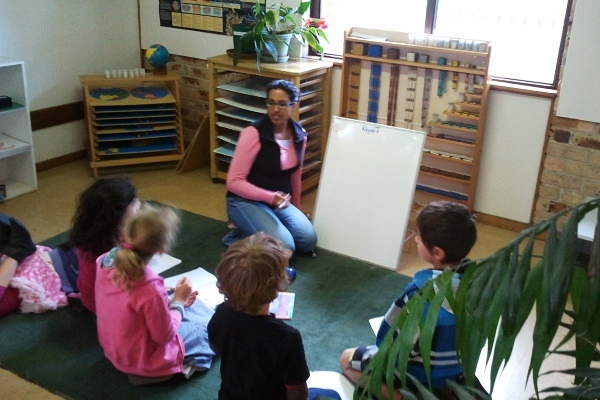 In a Montessori classroom the teacher is constantly on the move, overseeing, advising and assisting as necessary. The teacher may give a lesson to a small group here, to an individual there and always with reference to the individual needs of the children in the class. Throughout these Primary years social awareness grows. The Montessori Secondary class is designed for students from 12 to 18. The students continue to learn from and assist one another in their classroom community, which is surrounded by an environment suited to their adolescent needs. The classes continue to operate with the three-hour work cycle in the morning, which is similar to the primary school. A timetable operates to cover the 8 key learning areas, and is staffed by part-time and full-time staff members. Students in Stage 4 (Years 7 and 8) study all mandatory Board of Studies subjects. All subjects are studied in a two-year cycle, except mathematics, where each student is on an individual program, and Italian, where subjects are offered in year groups. Students in Stage 5 (Years 9 and 10) are offered electives in addition to the mandatory Board of Studies subjects. Electives generally offer students the opportunity to pursue and consolidate their interest and skill in a particular area of learning. Elonera Montessori School now offers the International Baccalaureate (IB) Diploma Programme for Stage 6 (Years 11 and 12). As an IB World School, we join a global community of schools that share a common philosophy – a commitment to high quality, challenging, international education that Elonera believes is important for its students. Independent research is an important aspect of the Secondary classrooms and the students explore alone, in cooperative groups and as a class, such subjects as science, philosophy, literature, history, cultural studies, mathematics, humanities, and earth studies. As they study, the students begin to perceive the relationships between these fields and often find that new areas of study open for them. The Montessori classroom utilises a modified contract system wherein certain areas and amounts of work are covered within a period of time. The student is responsible for ensuring that their work is covered. Each student is therefore able to develop his/her own work patterns. In a Montessori classroom the teacher is constantly on the move, overseeing, advising and assisting as necessary. The teacher may give a lesson to a small group here, to an individual there and always with reference to the individual needs of the student in the class. Throughout these adolescent years, tolerance, cooperativeness and social awareness grow.